BRUNSWICK COUNTY – The Southport Fire Department Fire Prevention Team came together with several local fire departments in Brunswick County to educate communities and schools in the importance of fire safety during Fire Prevention Week. 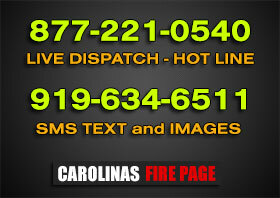 BRUNSWICK COUNTY – Fire nearly destroyed a 72-year-old landmark restaurant in downtown Calabash Monday evening. Photo of Kannapolis Engine 11 (A Shift) after a working dwelling fire in north Kannapolis. GREENE COUNTY – Scuffleton, Hookerton and Maury firefighters were dispatched to a reported structure fire on Saturday, October 20th at 02:36 hours. WARREN COUNTY – After months of planning and preparation, the North Carolina Forest Service (NCFS) conducted its annual Region-2 (Piedmont) Fire School the week of October 8-12, 2012. Classes were conducted at Medoc Mountain State Park, Halifax-Northampton Regional Airport, and Davie Volunteer Fire Department in Halifax County. PITT COUNTY – The fire that destroyed a house owned by a local ministry has turned deadly. Officials at the Jaycee Burn Center in Chapel Hill say Kris Wentling has died. She was injured in the Wednesday morning fire on Old Tar Rd. outside of Winterville. GASTONIA – The Gastonia Fire Department responded to a house explosion and fire on Fair Oaks Drive on Monday afternoon.